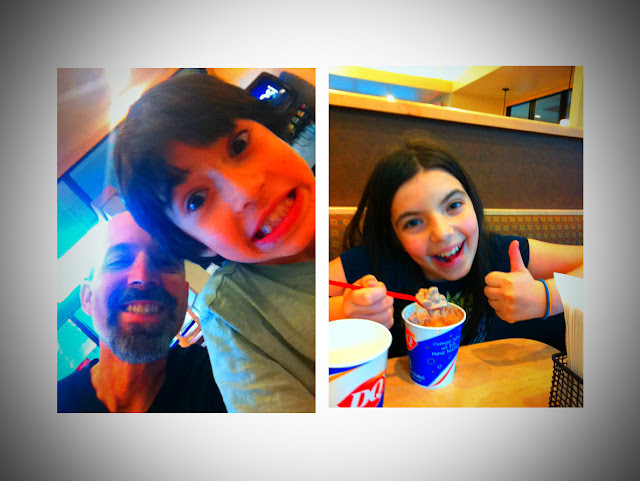 We went to a Dairy Queen this weekend, a fairly normal thing to do. I posted a picture Friday of myself with some motley crew and the (imaginary) phone hasn't stopped ringing. "Normal people don't act that way!" the voices have been telling me. And if they do, they certainly don't blog about it. Ultimately I am a self-satisfied, middle-aged family man, with the wife and kids, and bloated self-esteem. I have to try really, really hard to appear not normal. For those times that readers think that I am somehow outside the mean, consider where I live -- that usually sets the point closer to the regression coefficient line on the graph. Although I pretended to be cool, I paid the guys in beards and costumes to pose for the picture -- they were raising money for charity. I got a nifty post and they got 20 bucks that could actually make it to a 501(c)3. Although Portland has its bearded men in tutus, the majority of people are normal like me. We support the outliers if just to reinforce our own normalcy. Had I asked, some of the beards were probably normal as well. I even made a video of my normal kids.